The TV commercials which currently make me most grateful for my mute button are for Scotiabank. This campaign offers a series of homey scenarios, over which some guy with one of those squidgey, vaguely-creepy voices describes, in a stream of sentences annoyingly beginning with ‘Because’, why the people in those scenarios are Scotiabank customers. All age groups in the middle-class target are covered; extra comfort (for Riverdance fans at least) comes from Celtic music. And I now know that, if I ever lose my mind and want to work on my lap-top while perched on a stool in the middle of a lake, my account with Scotiabank will allow me to do that. Condescension is insulting. Humour works best. And, as we’ve seen with Richmond Savings’ successful ‘Your Money Is Our Money’ campaign, humour does work for financial institutions. 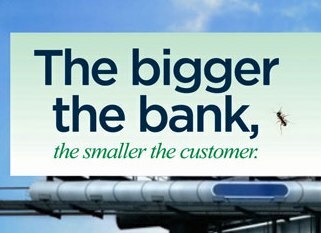 For what they pay for creative, surely the Big Banks can come up with something funny. For example, envision a 35 year-old woman meeting with a Big Bank loans officer. She has a terrific, original idea for an interactive, educational game. She has a business plan, a marketing plan and a solid resume. She needs $100,000. and doesn’t want to liquidate any assets to raise it. But she has trust fund statements, photographs of the West Vancouver police arriving at her mortgage-burning party and notarized promissory notes offering her children as collateral. And the loans officer says: “So you call this ‘New Media’? Hmmm. Could you get your ex-husband or parents to co-sign?” Ha ha ha ha. Well, that’s not funny but it’s pretty much the way it is, even in this supposed Age of Big Bank Enlightenment. Which is why anyone trying to get ahead in new media and/or film needs access to money. Lots of it. With easy, patient terms and helpful, co-operative administrators. For extra advice, you can book a lunch date with Kim Campbell, the Canadian Consul General to Los Angeles. Unfortunately, while you’re down there, you can also drop in and say hello to the guys at Totally Hip Software. Now, thanks (they say) to the BC government’s lack of support, they’re there too. This entry was posted in General Ranting, Humour, Television and tagged Big Bank, Bradley Manning, Canada, Kim Campbell, Los Angeles, Riverdance, RSS, Scotiabank, United States.